Place the flour, thyme and a good pinch of salt and plenty of freshly ground black pepper in a large freezer bag. Put the rabbit portions into the bag, a few at a time, and shake well until evenly coated in the seasoned flour. Transfer to a plate. Melt the butter with one tablespoon of the oil in a large heavy-based frying pan over a medium heat. Fry the rabbit, a few pieces at a time, until golden-brown all over. Put all the front and rear leg portions into a flameproof casserole dish. Transfer the saddle pieces to a plate, cover loosely and set aside (these will need less cooking time, so can be added later on). Preheat the oven to 170C/340F/Gas 3½. Add a little more oil to the pan and cook the bacon until the fat is browned and beginning to crisp. Add the bacon to the casserole dish. Add a dash more oil to the frying pan and fry the onion for 5-7 minutes, or until lightly browned and beginning to soften. Add the onions to the casserole, sprinkle with any flour remaining in the freezer bag and stir until well combined. Pour half of the cider into the frying pan and stir vigorously with a wooden spoon to lift any sediment from the bottom. Simmer for a few seconds then pour into the casserole. Add the rest of the cider and the stock. Stir the bay leaves into the casserole, cover with a lid and cook in the centre of the oven for 45 minutes. Remove the casserole from the oven, add the reserved saddle pieces and carrots, turn all the rabbit portions, ensuring that as much of the meat is covered by liquid as possible. (Not all the meat will be covered.) Return to the oven for a further 1-2 hours. Take the casserole out of the oven after one hour and check the rabbit – the meat should be starting to fall off the bone when the rabbit is ready. Poke the leg portions and the saddle pieces with a knife and if it doesn’t slide in easily, return the casserole to the oven. Check again for tenderness and turn the rabbit portions every 30 minutes or so. 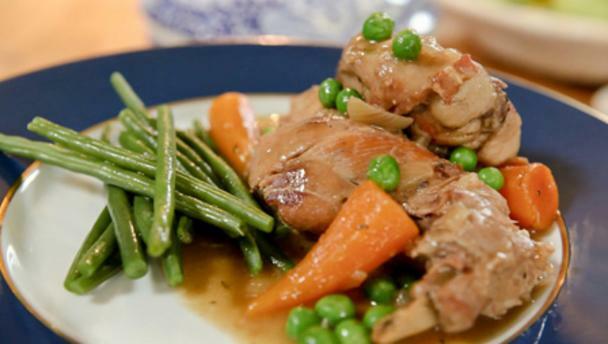 When the rabbit is tender, skim off any fat that may have risen to the top of the casserole with a large spoon. Carefully transfer the casserole to the hob. Bring to a fast simmer and cook for 3-5 minutes, or until the liquid reduces to a slightly thickened, gravy-like consistency. Stir in the frozen peas and simmer for a further three minutes. Season with salt and freshly ground black pepper and serve.